Ιδανικό για χαλάρωση και διασκέδαση, το Runway Guesthouse βρίσκεται στην περιοχή Ίντσεον Έρπορτ της πόλης Incheon. Το συναρπαστικό κέντρο της πόλης είναι μόνο 0.7km μακριά. Με την βολική του τοποθεσία, το ξενοδοχείο προσφέρει εύκολη πρόσβαση στους προορισμούς της πόλης που πρέπει οπωσδήποτε να δείτε. Το Runway Guesthouse προσφέρει άψογη εξυπηρέτηση και όλες τις βασικές ανέσεις στους ενθουσιώδεις ταξιδιώτες. Τα δωρεάν WiFi σε όλα τα δωμάτια, υπηρεσία ταξί, φύλαξη αποσκευών, υπηρεσία στάθμευσης οχημάτων, χώρος στάθμευσης οχημάτων είναι μόνο λίγες από τις εγκαταστάσεις που κάνουν το Runway Guesthouse να ξεχωρίζει από τα άλλα ξενοδοχεία στην πόλη. Η ατμόσφαιρα του Runway Guesthouse αντανακλάται σε κάθε δωμάτιο. Στην ιδιοκτησία θα βρείτε δωρεάν τσάι, θυρίδα, πετσέτες, κρεμάστρα ρούχων, παντόφλες, καθώς και πολλά άλλα. Το ξενοδοχείο προσφέρει υπέροχες ψυχαγωγικές εγκαταστάσεις όπως οι μονοπάτια για πεζοπορία, σάουνα, γήπεδο γκολφ (στον χώρο του ξενοδοχείου), γήπεδο γκολφ (σε απόσταση 3χλμ. ), ψάρεμα για να είναι η διαμονή σας αξέχαστη. Ανακαλύψτε ένα ευχάριστο μείγμα επαγγελματικών υπηρεσιών και μια μεγάλη ποικιλία ιδιαίτερων χαρακτηριστικών στο Runway Guesthouse. I stayed here for just 2 days and 1 night before leaving Korea since it is a 5 to 10 mins travel to the airport via cab. Although location is a bit secluded, it is near Lotte Mart so you can do last minute shopping for your family and friends. The owner of the guesthouse is really friendly and helpful. He scheduled a cab pick up and willingly helped me carry and load all my luggage and packages. The house is clean and beautifully maintained. Sending my regards! My experience in Runway Guesthouse can not be better. The host is so nice and friendly. He can speak English so well. The house is designed by the host. It looks so excellent and modern ！And it takes only15min from Unseo metro station there. Nice and close to Incheon Airport (as the name suggests), only 2 stops on the airport line (from Unseo station) or a short 15 min bus ride away. 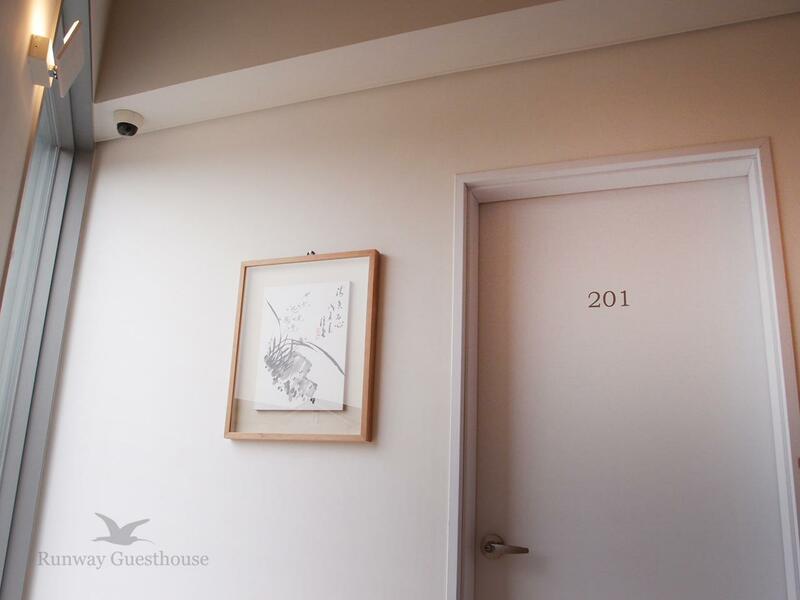 The guesthouse is modern, and the facilities are great! I would definitely go again, instead of staying in the airport. We stayed here because our flight arrived at 11:30 in the evening. We were thinking of staying in Incheon until the morning before heading to Seoul. The owner was very accommodating. We arrived 2am and he was there to greet us enthusiastically. It did not feel like checking into a guesthouse. If felt like coming into a friend’s home. The place was suuuupeeeer clean! The facilities were complete. We didn’t expect a free breakfast, but there it was. It’s not a cafe or a restaurant - it’s a home kitchen which is way better. You won’t feel alienated in this place at all. Staying in this guesthouse made the perfect prelude to our Korea vacation. Highly recommended place! My stay at Runway Guesthouse has been a short one, but as soon as I stepped past the entrance, I have been greeted with great warmth and hospitality. The place is great, and the owners are two great people and artists. The whole Guesthouse is built and furnished with great care and attention to details, and it's clean and absolutely perfect. 10/10, not only I would recommend it to anyone needing a place to stay in Korea, but I cannot way to fly back and visit this beautiful Guesthouse once more!! Host was super friendly and a really stylish guesthouse. Very very close to the airport. A little far from the train station, but walking distance, (about 20 mins walk). A little daunting at night because of the lack of proper lighting along the roads but fine during the daytime. The owner was very helpful and picked me up from the airport. Everything is very organised and very clean! The business is quite new. The building is in a quiet, peaceful neighbourhood. I gave 5 stars for location because it is perfect for getting to Incheon Airport: just 10 minutes by bus (very cheap ticket) and you can walk to the bus stop from the hostel in just 5 minutes. It would not suit someone who wants to visit Seoul and the city centre, unless you are prepared for the 1 hour train journey (one-way, I think). Despite getting to the guesthouse close to midnight, the owner was so understanding and even went out of his way to come pick me up because the buses had stopped running. The rooms were immaculately clean, the bathroom was clean as well, and everything was provided-shampoo, conditioner, body wash, toothpaste. Breakfast was toast with jam, boiled eggs, and tea/coffee. Also, it was only a 10 minute bus ride away from Incheon airport! A convenient, clean, and comfortable stay before heading out to the airport! The guesthouse was near to airport which within 30 minutes by public transport. Although it's quite far away from Unseo Subway Station, but I think that's okay with their price. The host was very nice and good at English, even I was checked in very late but he treat me very rapid and kind. I was satisfied about this guesthouse much, which I'll recommend those who need to stay near the airport with reasonable price. I would definitely stay here again. Quiet, clean rooms with friendly people, a park right outside the guesthouse, and excellent price. The owner is very kindly and friendly. Very beautiful house! I stayed here because my flight was the next morning, 10 min from the airport. The host was so nice and helpful. the rooms were nice and clean. recommend this place! This guesthouse is well designed, beautiful, clean and very hospitable. Great service! runway guest house is very nice building and clean. Very nice place close to the airport. Very clean, nice area, very kind hoster and all very good. I highly recommend it. Unseo Station στα 1.05 χλμ.